Factors such as Relationship issues, affairs, family issues, stress and anxiety, depression, addictions etc. if not dealt with appropriately will cause the individual to experience extreme emotions that they may not be able to deal with, which could cause them and their loved ones on going issues and concerns. Clarity Thinking was founded and is managed by me, Over many years, I have had extensive therapeutic experience which has enabled me to help many people in resolving their personal issues. I am a fully qualified Psychotherapist, gaining a Masters degree from Middlesex University. I am also a Therapeutic Counsellor who is a member of the BACP (British Association of Counsellor and Psychotherapists), and I am currently in the process of completing the accreditation process as set down by the BACP for experienced and qualified counsellors. Although qualifications enable a therapist to practice in an ethical and safe manner, however, life experiences and continuous personal and professional development aid the therapist in ensuring that they are working to their clients benefit. This is an aspect of our working model here at Clarity Thinking that we take extremely seriously. How do I monitor my own professional maintenance? I will frequently undertakes extra curricular professional training for continuous professional development. This on-going training helps to enhance the therapy I provided to my clients. It allows a greater understanding of the issues and concerns in the current context of society. As an ethical requirement I also undertakes regular clinical supervision as a way of self monitoring my work, and thus ensures that my approach of working is of the highest professional level. clients a calm, supportive and non-judgmental space to work through their feelings and move forward in a positive manner. The practice is centrally located within a professional business working environment, where there is ample free on site parking. Jasmer has studied extensively and qualified as a Psychotherapist through Middlesex University via The Society of Psychotherapy and Healing. Also through the Counselling and Psychotherapy Central Awarding Body (CPCAB). 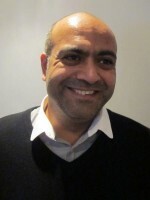 Jasmer is a fully qualified Therapeutic Counsellor. Senior Mental Health and Wellbeing Practitioner @ CHUMS. Oxford University, Brookes College; Course Tutor; Chrysalis Counselling Course. Northampton University, Course Tutor; Chrysalis Counselling Course.